The city will use only the energy it creates. The city will be extremely walkable. Those living there or just visiting won’t have to take any form of transportation, it will be easy for them to walk to most places. The city’s center will be entirely car-free. This will be made possible, in large part, by the city’s innate walkability. OAC plans to use a host of boundary-pushing, green technologies. While not all tech has been specified yet, the city will use driverless cars, auto-lighting, “smart” waste tech, and security tech. The city will only use only the renewable energy that it produces. This will cut down on fossil fuel use and the energy used to transport fuel and energy. OAC will sell excess energy that it produces, and it will also use excess energy to de-ice planes – cutting down the airport’s fuel usage. Only electric cars will be used inside of the city. Public transportation will be extremely close, a cycling route, and a host of outdoor activities that don’t require electricity. This location might seem random, but it could be ideal for the utopian city being planned. Oslo Airport expects its employees to double by 2050. This city could be a perfect location for their families to reside alongside visitors in transit. So, how possible is OAC, the sort of place that seems almost too good to be true? 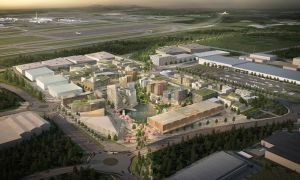 “We believe the future of airport city development in Norway and Oslo is not a matter of if, but when,” said Thor Thoeneie, managing director of OAC, to Dezeen. Construction is slated to begin in 2019 and the city is set to be completed by 2022. This seems ambitious, and the timeline might change, but with the country’s dedication to sustainability, it isn’t so far-fetched that this city of the future will soon become reality.